Andaman and Nicobar islands are located in Bay of Bengal ( India ). These islands spreads across the total distance of 780Kms. The total geographical area of these islands is 8300Sq.Kms. Nearly 6400 Sq.kms land area of Andaman group consists of reserve forest and are protected areas. 35 percent of this land is tribal reserves. The group of Andaman islands are made up of North, middle and South Andaman islands. There are nearly 300 islands and 200 rocky outcrops. But, only 24 islands (11 in Andaman and 13 in Nicobar) are inhabited. The nearest landmass in the north side is Myanmar, about 300kms from the Landfall island which is the north most island. At the south, the nearest land to Nicobar is Sumatra (Indonesia) at a distance of 150Kms. 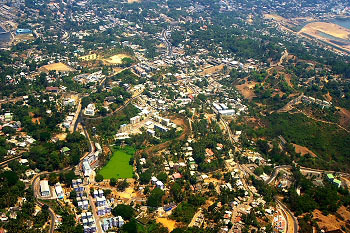 The capital city of this place, Port Blair is about 1200Kms from Chennai (India) and Kolkata (India). Daily flights are available from Chennai and Kolkata. Weekly once ship service is also available from Chennai and Kolkata. The Andaman and Nicobar islands are famous for the pristine clean coral beaches. These islands were in mystery for many years and condemned as forbidden land, also called the Kalapani. The total area of Nicobar islands is about 1800Sq.kms. Nearly 1500 Sq.kms is forest area. This group of islands consists of 24 islands. These groups are northern(Car Nicobar, Batti Malv), central or Nancowry( Tillangchong, Chowra, Teressa, Bompoka, Trinkat, Kamorta, Katchal and Nancowry) and southern (Little Nicobar, Great Nicobar, Pigeon, Megapode, Kondul, Pilo Milo, Menchal, Teris, Trak, Meroe) groups. The entire Nicobar is a tribal reserve. 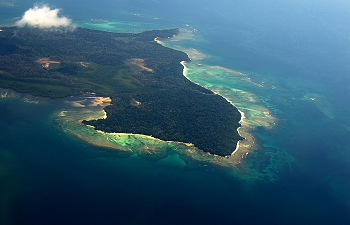 The Andaman group of islands are originally inhabited by the Great Andamanese, the Onge, the Jarawa and the Sentinelese. These have lived and flourished here for more than 20,000 years. Though the total population of Andaman and Nicobar islands is more than 4 lakhs, the population of these four communities put together is not more than 500. People interested in aerial photography of Andaman islands can sit at the left side of the flight (back seats are still better) while travelling towards Andaman. SLR camera with medium telezoom lens is better for taking quality photos. All varieties of accommodations are available to suit all kind of budget people. Both government and private agencies operate accommodation business. Tourist information centers are available at Port Blair to avail the required information about all kind of details. All kind of brochures are available at this center. 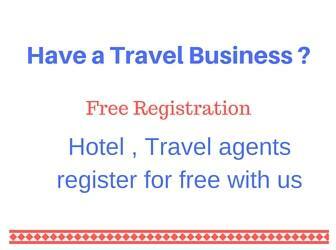 Booking for various hotels can also be made here. There is water scarcity during Summer season if rain is not there. The main source of water is ground water only. All kind of Indian food is available here. This shopping center is situated at the city, Port blair in Andaman Island. This is a cottage industry and emporium, a shopping place for the visitors. The normal package of Andaman island trip covers this place to allow travellers to purchase items. Pearls and gems are not sold here as it is against the Government's clearence. Khadi gramodyog emporium is seen nearer to Sagarika emporium of Port Blair in Andaman islands. Here people can see Wooden crafts, shell crafts and khadi items. This is a shopping place. During the stadard package of Andaman island trip, this place can be visited as the Sagarika emporium is covered in the list. The under water corals in Andaman island beaches are colourful. One can experience the live corals at Jolly buoy, red skin, North bay and other island beaches. Snorkeling and Scuba diving is a great experience in these marine world. People who don't know swimming also can experience this marine world as they will be escorted by experienced person and rubber tubes will be provided. There are so many travel agents in India providing information and arranging package trips to Andaman and Nicobar Islands. For Andaman INR 25000 is sufficient (transportation, food, accomodation and entry fees) for a family with parents and two kids below 12 years. If possible bargain with the agents to reach Andaman via Chennai and return to Kolkata. The trip plan can include local site visit at Chennai and Kolkata also. The best season to visit these islands is from October to early May. Avoid traveling in these islands during rainy season. There will be transportation problems by road in many of the areas, especially in South Andaman area. This is because of the Tsunami which had hit during December-2004. City trip � consisting of,Cellular jail, Fisheries museum(called aquarium, situated near the Andaman water sports complex. Varieties of corals and lot of marine life collections can be seen here), Samudrika - Marine museum(This is run by Indian Navy. Varieties of shells and marine life collections can be seen here too), Anthropological Museum ( situated at Port Blair. Details of tribes living in Andaman can be seen here. Arts and handicrafts of these tribes are also can be seen), Forest museum (Depicts the forest activities and the sawmill miniature models. This museum is set by the forest department), Mini zoo , Sagarika � cottage industry and emporium (shopping place), Khadi gramodoyg Emporium (Wooden crafts, shell crafts and khadi items are available for shopping), Gandhi park (a relaxing place situated at the heart of Port Blair. Japanese temples, water sports are available here), Chatham saw mill (This is the oldest and biggest saw mill in Asia), Corbyn�s cove beach (Nearer to this beach, resorts (both government and private) are also available), Water sports complex (All kind of water sports facilities like wind surfing, scuba diving, speed boat round etc� are available here). Viper island. One hour sea journey (Harbour cruise) from Phoenix Bay Jetty of Andaman. Main interest in this island is the open space jail which was constructed before the construction of Cellular Jail. It is also called Women jail. North bay, This beach is 15 to 20 minutes journey by sea from Phoenix Bay Jetty at Port blair. Ross island, the then capital of Andaman And Nicobar islands. This island is now under Indian Navy. This is just 20minutes sea journey from Phoenix Bay Jetty of Port Blair. Mahatma Gandhi marine national park, around 30 Kms from Port Blair. This is situated at the place called Wandoor. The place Wandoor, has got an excellent beach. Jolly buoy. This place is very famous for under water corals and the pristine clear beach. This place is one hour sea journey from Wandoor. Snorkeling and scuba diving available here. Red skin island. Available in the same Mahatma Gandhi Marine national park. This island is also famous for under water corals and marine life. Havelock island. This island is famous for its golden sand beach and bluish sea water. Four hours Sea journey from Port Blair. Baratang , Located at Middle Andaman. The journey is through thick, dense forest area. The forest area journey is about 50Kms. Limestone caves near Baratang jetty. The Sea journey is through boats, 45minutes to one hour journey. Mud Volcano, near Baratang jetty. 20 minutes journey by road. Rangat. 170Kms (6 hours journey) by road and 90 Kms by sea from Port Blair. Biggest town in the middle Andaman. Diglipur. North Andaman, 290 Kms away from Port Blair. Journey runs through Jarwan tribal reserve. Chidiyatapu. Approximately 30Kms from Portblair city towards south. A must visit place for Sun set. Hut bay islands. Over 100Kms from the main city Port Blair. The transportation is provided by inter island shipping services. Mount Harriet. 55Kms from Port Blair by road. Ferry facility available to reach the place. Forest guest house (huts) at a height of 365 mts (above sea level) are available for staying. There are some good tourist packages available locally in Andaman also. Travellers who wish to visit without any package booked from India can also consider booking at Andaman arranging only their tickets to Andaman from India. Below is some information about standard trip packages at Andaman. During end of December-2004 there was a disaster at Indonasia and several parts of Andaman Nicobar islands because of Tsunami. Even eastern part of India near Chennai got affected and so many people died because of this natural calamity. This picture shows the present (March - 2007) situation in South Andaman where some area is still filled with salt water making the soil useless for cultivation. The budget for the package including accomodation and tour varies from INR 3800 to INR 4000 for a 5 days and 4 nights in AC Room. For Non AC rooms, it varies from INR 3500 to INR 3800. Packages are also available for 4 days and 3 nights. The cost would vary from INR 3200 to INR 3500 for AC rooms and from INR 2900 to INR 3200 for NON AC rooms. The Northest point covered in these packages is Baratang only which is at Middle Andaman. Tourists who wish to visit North Andaman have to book separately. The tour package also covers one day local site seeing at Chennai and Kolkata. Kapeleshwara temple, Marine beach, Snake park, Museum and Vivekanda house. Tourists are free to select visiting Chennai during their onward journey and Kolkata while returning or travelling through Kolkata and returning via Chennai. Hi, We are planning visit for 6D/7N. We are 10 family members.Please give us suitable package. Myself and my wife wants to visit Andaman during Durga Puja (28th Sep to 3rd Oct) or during chrismas (25th Dec - 2nd Jan). Please send me details for 6 nights/7 day tour package. me and my wife are planning to visit Andman during 19-24 dec 09.please send us the package cost and other details like accomodation, food and transport etc. Please mention the name of the hotels and places to be visited.i donot want to stay in havlock island and baratang. We want to visit Andman in Feb 2010. Please send me details for 6 nights and 7 days, for a couple. We are 2 people visiting andaman in May 2010. Pls send us the Complete Package(inclusive of everything) details for 5N/6D. We are 3 people plannin to visit andaman for 5N/6D. Pls send me details of the package including everything(Right from sea travel to/fro from chennai). we are going to plane andaman and nicobar at diwali vacation. we are 5 adult and 2 children. please send me economic and good package and also give guidance. we are from ahmedabad. Hi, I am interested in going from India oversea to Sumatra, Indonesia. ANd I was wondering if it is possible to go from Andman or Nicobar to Sumatra by boat? MY FAMILY IS PLANNING TO GO ANDMAN IN FIRST WEEK OF APRIL 2011 FOR 6 TO 7 DAYS, WE WANT TO REACH ANDMAN FROM KOLKATA THROUGH SEA(IN DELUXE CABIN OR A CLASS CABIN) AND RETURN THROUGH AIR IN ECONOMY . KINDLY ADVICE A COMPLETE PACKAGE WITH DETAIL CHARGES. me and my husband want to visit Andaman for 8 nights from chennai. please give us the details and rates..we want to vist most of the places in andaman. we want water sports too.. we would want to visit in oct last week to nov 1st week. We are 3 people reaching Port Blair by air on 16th Jan 2011 at about 07 A.M.We have already booked hotel at Port Blair for 4 nights+ 5 days. Please let me know regarding details of guided tours only to Port Blair,nearby tourist places one day tour to Havelock without night halt(at Havelock).Please quote your charges for adults at your earliest. We are 2 people visiting andaman in March 2011. Pls send us the Complete Package(inclusive of everything) details for 3N/4D. We are 2 adults planning to visit Adnamans in the April 2011. Visiting from Mumbai. We are 2 adult and one kid - 4.5 yrs visiting andaman in 21-24 April 2011. Pls send us the Complete Package(inclusive of everything) details for 3N/4D. Hi, I am planning visit for 4D/5N on honeymoon in Andaman during 4th week of Mar'2011.Please give us suitable package. cost of tickets airways and ship..
how the whether will be..
Hi Hello sir, we r 3 (my wife 3 years kid & myself) planing to visit andaman in Sep 3rd week. Please let us know about offers. We are 2 adult and one kid -5 yrs visiting andaman in may 2011. Pls send us the Complete Package(inclusive of everything) details for 3N/4D. Hi, I am planning to go for a 4 day holiday trip to Andaman. Myself, my wife and 2 Kids aged between 6 & 11. Pls send us the Complete Package(inclusive of everything) details for 3N/4D. Hi, I want to visit Andaman with my wife. I want to visit entire Andaman and Nokobar Islands. Package length does not matter. Plz provide me the necessary details. Thanks in Advance. i want to visit andaman with my wife and 6month old baby for one week. so please send me the best packages available. sir, i want to visit andaman with my wife and 10 yrs old daughter for 7 -8 days pl provide me complete package for the tour..thanks..
hi. i am planning to visit Andaman with my parents for 6days-7nights.the no of members is 3. please send me the complete package details inculding flight fare.thankx in advance. Hello, Its me saikat 4m guwahati. We are planning for andaman and nicobar trip this december, we are 7 adults + 1 child want to reach by air and return by ship to kolkata in economy class. So send me each and every details with recommended accomodation and no of days of our trip. I want to visit Andaman during puja.Total 3 adult and a 3 yr. kid for 5 days, travel by air from kolkata .let me know the complete package cost including hotel,site visit and others if any. hello sir,we are 4 persons planning to visit andaman at the starting of july.i know its not an ideal timing because of monsoon,but is it okey to visit at this time? we are also looking for econimic trip including accomodation,food and site seeing with snorkelling.please provide us the details. I am planning to visit Andaman & Nicobar islands in the Month of Dec..probably from Dec 3,2011 to Dec 9,2011. Send me the package details including following information. Very nice description of the tour. We are interested in visiting Andaman this year. Is it possible to make plan in August / September? Can you please tell us how much time will it take to cover all the places in Andaman and approx budget for a couple???? We are interested in visiting Andaman this year. Is it possible to make plan in November? Can you please tell us how much time will it take to cover all the places in Andaman and approx budget for a 8 people???? I wants to visit Andaman & Nicorbar so pls suggest us for the same . We are going to explore Andaman , 5N/6D trip including one night at Havelock . can you please help me by informing what are the place i must plan ? name my jiju. i gone with my uncle jobin and aunty alyemma to andaman. there i is eat coconut and drunk vimto. poda!! i left quicly after i seeen my math sir. I am travelling in december for Honeymoon trip? How I plan my travelling? Is it better to stay more in Havelock or Port Blair? we want to explore Andaman in last week of feb 2014,plz send us d best nd economic package details(including-accomodation,meals,transfers,site seeing,scuba,parasailing,etc) for 2people for 5N/6Days. with n without air tickets from Delhi. i just been there 5 days in June 2014. Could not cover all places due to off season. I wish to visit andaman with family from 02 to 07 Oct 14plz send us d best nd economic package details(including-accomodation,meals,transfers,site seeing,scuba,parasailing,etc) for 2people for 5N/6Days. without air tickets from Delhi. I alongwith my wife and two childerns (both are adult) are planning to visit Andaman and Nicobar island for seven nights from 18th sep, 2016. Will u advise me the places to visit in portblair, havlock and neil islans. How much time it will take to reach from portblair to Lime stone caves and what will be the package four persons in four star hotels in all the places including transportation to all places by private boats.